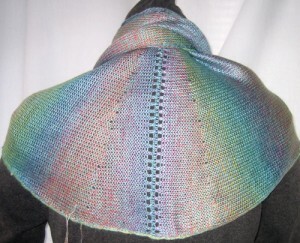 A Baktus is a very simple triangular scarf/shawl. I have many oddball skeins of sock yarn, it is possible to knit a small baktus with a single one. An online search will yield many free patterns, most for hand knitting, easily adapted for the KM. Many patterns are free, including some in the latest catalog at Garn Studio. 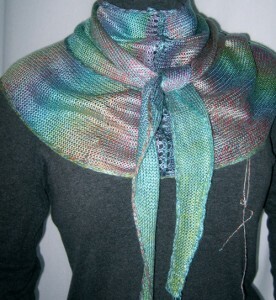 Such scarves may be worn in hoodie and bib styles, or as neck/ shoulder wraps. I am not personally fond of triangles with no shaping, so I thought I would try a KM version, rounding the bottom point of the triangle. Here are the results, with yarn tails still attached. I began with casting on 5 stitches, and increasing one stitch every 4 rows on one side up to the required length, then adding a short row “spiral” section, and removing that piece on waste yarn from the KM. A second identical piece was knit, and the 2 halves in turn joined on the KM. Part of the goal was to evaluate alternate joins for future lace shawl triangular pieces. Finished measurements after blocking were: 36 in in length on straight edge for each half, 12.5 in @ widest point. The width is in the common range for handknit versions, the length of 72 total longer than the common 55-63, but suitable for a loose tying of scarf. This piece will be in my “consider qualities” pile for a while. Personal taste and preference do not necessarily match that of others, or those receiving item as a gift or purchasing it.